At Baytown Tree Care the customer service and attention to detail that our representative’s practice is on another level from the competition. The tree care service is a fully comprehensive and patented set of services that allow our service to stand away from the rest of the pack. The quality and care of our service is unmatched in Texas. We walk away leaving our customers happy since we always make sure to check back in with our customers after we provide them with any of our wonderful services. We have our in house trained professionals relate their years of experience when it comes to taking care of all the needs and wants any customer could possibly have. With our tree service there is no end to the possibilities when it comes to the number of solutions we offer our customers. Maybe there has been an emergency storm situation or perhaps your tree line and dead branches are making the rest of your house look unsightly. The proud and passionate employees that Baytown Tree Care employs will be able to handle any job no matter the scenario. The service that we provide is absolutely peerless when drawing comparisons to our level of overall customer satisfaction. The community that has made us the number one tree care provider in Baytown deserves the top quality experience that only we provide for our wonderful customers. We are unmatched in the thorough display of care and excellence that earmarks each project or job that we complete. The only problem that our customers seem to have is stepping out of the ay when our inexpensive and overqualified teams of trimmers, removal specialists, and weed control guys comes to help you out with all of your home and garden needs. Whether you have an old dead tree hunched over the garage where you keep your automobiles or you have a problem area of branches that are low hanging, we can help you out at the lowest rates possible. 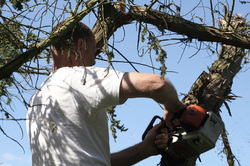 Your tree care and maintenance is our specialty! Someone's gotta care about your trees and if you call (281) 975-0077 today, it may certainly be us.